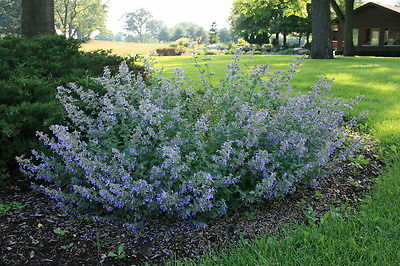 Nepeta - Blue CatmintViolet-blue bloomspikes several inches tall atop low-growing, spreading 10-inch plants of spinach-green with small, narrow foliage. The florets fan out from all sides of the spikes, held up and out. These violet-blue spikes bloom all summer atop vigorous 10-inch plants that spread readily in any soil--even those infertile, dry spots where little else is happy. These plants quickly form a low-growing mat that carpets the ground and reblooms year after year! Grow in any soil that is well-drained.